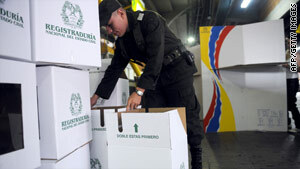 A Colombian police officer inspects electoral forms at a polling center in Medelllin on May 29. (CNN) -- The two leading candidates in Colombia's presidential race will compete in a runoff June 20, since neither garnered more than 50 percent of the vote in Sunday's election. With 99 percent of polling stations reporting, Colombia's National Civil Registry said Defense Minister Juan Manuel Santos had 46.6 percent of votes while former Bogota Mayor Antanas Mockus received 21.5 percent of votes. Polls had placed the two in a statistical dead heat going into Sunday's election, but more than twice as many voters cast their ballots for Santos -- who has led high-profile operations against leftist guerrillas during his tenure. In a speech Sunday Santos praised outgoing President Alvaro Uribe's leadership and asked for supporters across the political spectrum to join his campaign. "My government will be a government of inclusion. It will be a government by all Colombians and for all Colombians, for work and against poverty. It will be a great agreement so that we can have work, work and more work," he said. At a rally Sunday evening, Mockus also called for unity and said he was determined to win the next round of elections, chanting with supporters as he jumped up and down on stage. "Together we can radically transform society. We know that violence, inequality and corruption are not a destiny. They are problems that we can overcome," he said. Voting proceeded smoothly for the most part Sunday, though a government official reported isolated clashes between the military and armed groups in the country's interior. One soldier was killed in one of the skirmishes, Justice and Interior Minister Fabio Valencia said. The winner of the runoff will replace Uribe, a two-term president who has high approval ratings for his tough stand against Marxist guerrillas that have been waging war against the government since the 1960s. Uribe also has been sparring with Venezuelan President Hugo Chavez, who Colombia accuses of supporting the rebels. Chavez told CNN en Español he will be glad to see Uribe go. "I think it will refresh all of Colombia. And it will refresh I hope and I think the relationships Colombia, our sister, has with Latin America, with the Caribbean," Chavez said in an interview that will air on the network Tuesday. Santos and Mockus, both 58, were the frontrunners in a field of six presidential candidates. Outside their differences in style, Mockus' and Santos' platforms are not worlds apart. Neither candidate is expected to take Colombia on a vastly different trajectory. But their views on neighboring Venezuela, whose relations with Colombia have been icy as of late, are notably different. Santos is a vocal critic of Chavez, who has countered that Colombia is threatening to destabilize Venezuela. Mockus is seen as more conciliatory toward Venezuela and went so far as to say that he admires Chavez -- a comment that he later amended to say he meant "respected." Uribe's clashes with Chavez have made headlines, particularly a shouting match between the two leaders at a private luncheon for heads of state during a summit of Latin American leaders in February. But his tough tactics against guerrillas from the Revolutionary Armed Forces of Colombia, commonly called FARC, garnered him high job approval ratings at home and two four-year terms in office. Uribe almost pulled off a third run for president, before a court stepped in and put an end to his campaign. With Uribe out of the race but riding high, attention shifted to his defense minister, Santos, who carried out many of the operations against the FARC and would continue them as president. But Mockus has a strong following among Colombian youth, who were made aware of his campaign through social networking websites like Twitter and Facebook. Santos has extensive experience in the federal government. He has served as minister of foreign trade, minister of finance and, most recently, minister of defense. He was educated in the United States, including stints at Harvard and the Fletcher School at Tufts University. As defense minister, some of the strongest strikes against the FARC came under his leadership, including the high-profile hostage rescue of former presidential candidate Ingrid Betancourt in 2008. Mockus, for his part, was the mayor of Colombia's capital, Bogota, from 1995 to 1997 and from 2001 to 2003. According to his official website, the homicide rate in Bogota fell by 45 percent during his tenure, and he improved the city's public transportation system. His leadership style has generated as much attention as his accomplishments. As mayor, he sometimes donned a "super citizen" costume on the streets, and hired mimes to make fun of motorists who broke traffic laws in an attempt to embarrass drivers into compliance. CNN's Juan Carlos Lopez and Mariano Castillo and journalist Fernando Ramos contributed to this report.